It’s College World Series time and while we aren’t too hip on college baseball yet we do want to congratulate the Big 12 on getting EIGHT teams into the College World Series. On a more local note, Kansas State is still alive as they play Rice tonight for a chance to move on to the super regionals. 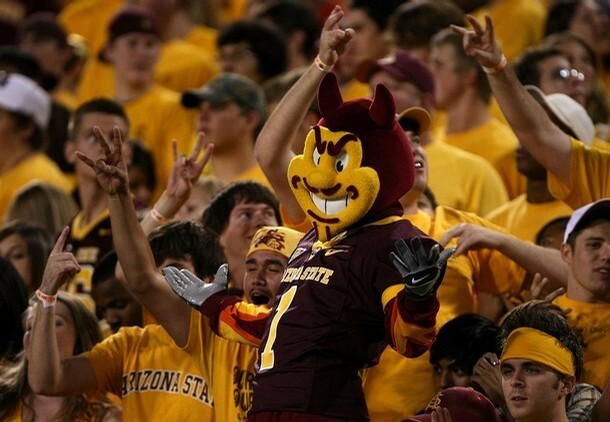 Feeling inspired by that and the scorching weather, this week’s Mascot Monday will take a look at an advancing, number one seeded, Arizona State’s Sparky the Sun Devil. From the iterations of mascots before to the family friendly inspiration of the current Sparky, we can see that this top party school has one spicy meatball of a mascot. So while we are waiting for the football season to start, under 100 days to go by the way, and while we endure the massive ting of the aluminum baseball bat, let’s numb the senses with Sparky.